This is our compact design, it is a super-flat indoor TV antenna that you can hang on a wall or window. It is made of the highest quality components and has performance on par with or better than much bulkier metal antennas. This antenna is fantastic in terms of performance, and hide-ability. You can simply hang it on a wall, and you wont even notice it! 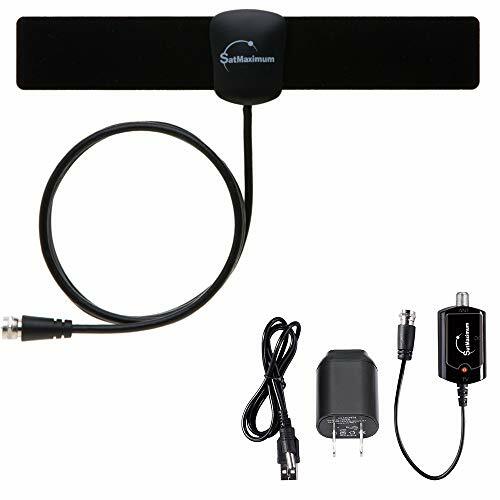 Designed for use with select HDTVs, this multidirectional Satmaximum Leaf antenna comes with an amplifier that ensures clean, powerful signals and features a range of up to 40 miles for optimal coverage. HDTV 1080P, 1080i, 720P Support 1080p output enables you to enjoy crisp high-definition content on your TV.